In a storybook start to his major-league career, Jason Heyward hit a home run with his first swing minutes after being anointed by one of the game’s all-time sluggers. On April 5, 2010, the Braves opened their season against the Cubs at Atlanta. Heyward, a Georgia prep standout selected by the Braves in the first round of the amateur draft three years earlier, was tabbed by manager Bobby Cox to debut in right field and bat seventh. Braves icon Hank Aaron was there to throw the ceremonial first pitch and Heyward, 20, was given the honor of catching the toss. After delivering the pitch, Aaron offered advice to the rookie. He said, ‘Have fun. You’re ready to do this,’ ” Heyward told the Atlanta Journal-Constitution. Soon after, in the opening inning, Heyward stood in the left-hand side of the batter’s box, taking his first big-league at-bat. The score was tied at 3-3 and the Braves had two runners on base. Carlos Zambrano, an imposing right-hander, was pitching. Zambrano’s first two deliveries to Heyward missed the strike zone and Heyward didn’t bite at either. On the 2-and-0 pitch, Zambrano threw a sinking fastball toward the inner part of the plate. Heyward swung and sent a drive 446 feet into the right-field stands for a three-run home run. The cheers from the Turner Field crowd were so loud, “I couldn’t hear myself think,” Heyward said. “He’s by far the best 20-year-old I’ve ever seen,” said Braves catcher Brian McCann. Heyward followed the Opening Day home run with an impressive first season. 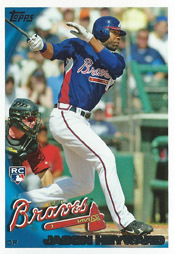 He hit .277 with 29 doubles, 18 home runs and 72 RBI for the 2010 Braves. His on-base percentage was .393. Four years later, on Nov. 17, 2014, the Braves traded Heyward and reliever Jordan Walden to the Cardinals for pitchers Shelby Miller and Tyrell Jenkins. The Cardinals needed a right fielder to replace Oscar Taveras, who died in an auto accident. The Braves needed pitching. Heyward batted .293 with 33 doubles and 23 stolen bases for the 2015 Cardinals and earned a Gold Glove Award for his fielding. After the season, he became a free agent and signed with the Cubs. on March 25, 2018 at 5:23 pm | Reply Can Heyward bounce back from subpar seasons? – A.I.O.S.N.